Can I use OCTANE Energy Drink™ as a Pre-Workout drink? YES! OCTANE Energy Drink™ powder mix offers Nitric Oxide ingredients along with a complete blend on additional amino acids which other pre-workout products don't come to close to offering. 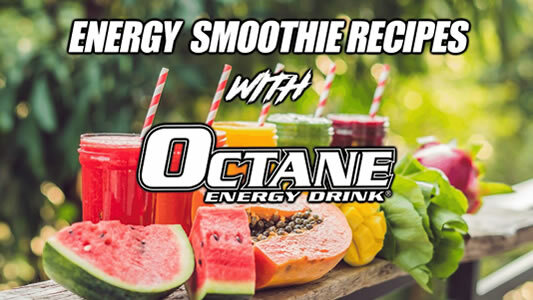 OCTANE Energy Drink™ offers more nutrition per serving and is much healthier for you than any alternative energy powder mix, energy shot, canned RTD energy drink or pre-workout drink mix. How much caffeine is in OCTANE Energy Drink™? 225mg per serving. This is listed on both our Supplement Fact Panel on our labels and our website Supplement Facts link. Does OCTANE Energy Drink™ give you the jitters? Caffeine effects everyone different. We have men and women all over the Unted States using OCTANE Energy Drink and we have had no complaints of jittes. Note: if a serving is too strong, just reduce the serving size to 3/4 or 1/2 scoop. Are the ingredients in OCTANE Energy Drink™ non-GMO? YES, the ingredients in OCTANE Energy Drink™ are Non- GMO! Does OCTANE Energy Drink™ contain any Gluten? No, OCTANE Energy Drink™ is a 100% Gluten free product and is safe to consume by those who are sensitive to Gluten. Does OCTANE Energy Drink™ contain any milk derivatives? 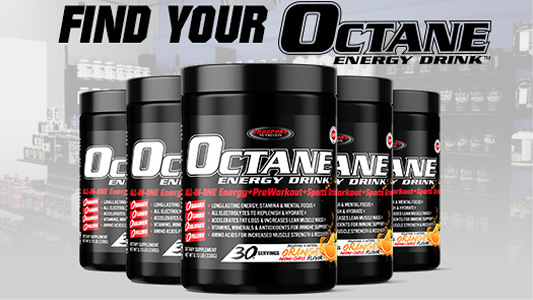 No, OCTANE Energy Drink™ does not contain any milk derivatives and is Dairy Free. 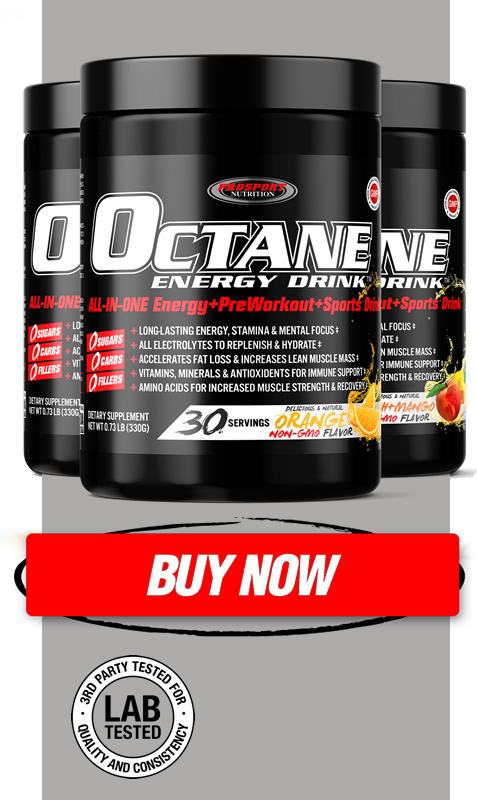 Does OCTANE Energy Drink™ contain 1,-3 dimethylamylamine? No, 1-3 as we call it internally, is not in OCTANE Energy Drink™. After the ban on Ephedrine Alkaloids in the mid 2000s, the supplement industry was looking for a potent alternative, and this is how 1-3 came about. However 1-3 quickly got a reputation for being another version of speed, and had very negative side effects in higher dosages. 1-3 has been banned by the NCAA, and was added to the 2010 World Doping Agency prohibited list in 2009. It is currently on the FDA watch list, with a very likely federal ban in the near future. Octane Energy Drink™ does not contain any banned ingredients. Can my son who is 16yrs old and plays sports drink OCTANE Energy Drink™? OCTANE Energy Drink™ is built for adults 18yr and older. Note: The only thing in OCTANE Energy Drink™ to watch for is the caffeine of 225mg. However kids today are drinking coffee and other caffeine drinks at an early age. So we would say, its OK as long as they're 16yr or older and under parents supervision. We would recommend only a half serving mixed with full dosage of 12oz of water. Are the BCAA's in OCTANE Energy Drink™ a 2:1:1 ratio. Yes, our BCAA's (L-Luecine, L-Valine and L-Isoleucine) are in the proper 2:1:1 ratio. Will OCTANE Energy Drink™ cause bloating? No, OCTANE Energy Drink™ is calorie free, creatine free, and is low in sodium, to ensure no water retention. Our formula is contest prep grade, meaning its safe to take in the weeks leading up to a fitness competition or bodybuilding show. During these last few weeks competitors are trying to shed the remaining fat and water weight to get ready for the judges. Our formula also contains no fillers, so it will not affect blood sugar levels. Is OCTANE Energy Drink™ Safe for Diabetics? When I mix up a OCTANE Energy Drink, are the little white specs the amino acids? Yes, those are the amino acids. Can pregnant or nursing woman take OCTANE Energy Drink™? Even though OCTANE Energy Drink™ was built to be the healtheist energy drink, sports drink and pre-workout on the market, its still a nutrition supplememnet which contains caffeine and there for states on our product label that children and pregnant or nursing woman should be consult their Health Care Physician before use of this product. Is Silica in the Other Ingredients of OCTANE Energy Drink™ a Filler? NO! Silicon dioxide (silica) is found in many multivitamin and mineral supplements because silicon is necessary for good health. As a necessary nutrient for the health of your skin, hair, nails and bones, dietary silicon may also help to prevent arthritis and osteoporosis. But silicon dioxide also works as an "anti-caking agent", and is added as an ingredient in foods to help keep your processed foods appetizing. Why is the OCTANE Energy Drink™ container only half full? Because we do not add any FILLERS to expand our nutritional powder base to make you think you're getting more product. 2nd, we had to choose a container that fit our label.